Kristen Vidal – It's Hamiltime! 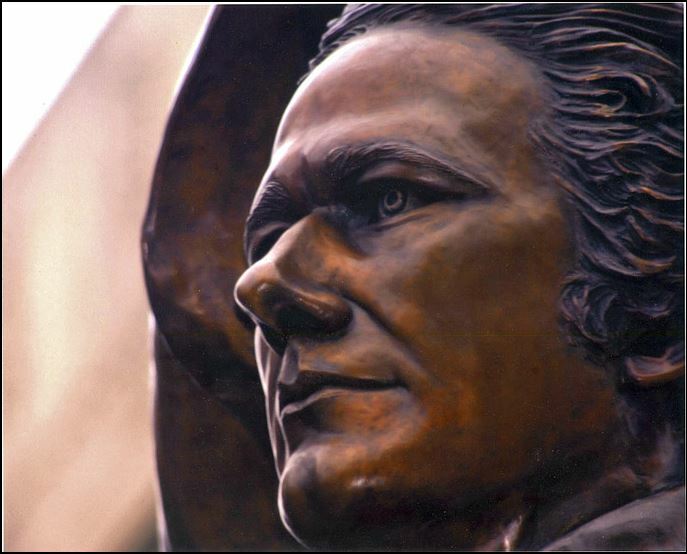 In 2004, the city of Hamilton, Ohio unveiled a dramatic, larger-than-life sculpture of Alexander Hamilton entitled “The American Cape” featuring Hamilton wearing an American flag as a cape. The statue is reportedly the largest rendition of Alexander Hamilton in existence. This life and a half public monument was installed on High Street in Hamilton, Ohio in October, 2004. Created as the namesake work for the City, Visbal was selected through an international competition. The American Cape depicts Alexander Hamilton as orator and is the largest rendition of this historical figure to date. The piece was named for the large cape which billows behind Hamilton and is complete with the 13 star flag of Hamilton’s era. Hey Hamilton! a website dedicated to providing local information about Hamilton, Ohio states:. On the south side of High Street are plaques highlighting phases of Hamilton’s life and his major contributions to forming the United States. Something to check out if you’re ever in Butler County, Ohio!